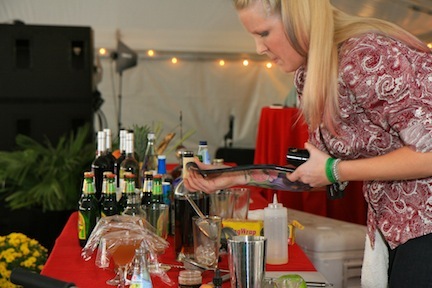 This year Taste of Atlanta offered up another dose of cocktail competition. 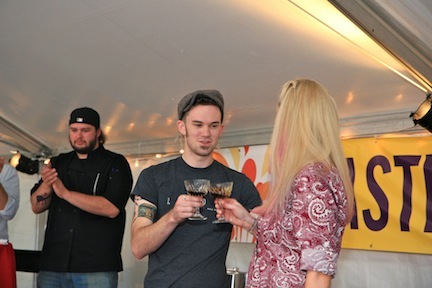 We’ve got to give big props to Tyler Nelson of Leon’s Full Service for winning the title of Atlanta’s Best Bartender. The 2011 Barcraft competition (sponsored by the newly formed Atlanta chapter of the United States Bartenders Guild) hosted qualifying matches then narrowing it down to Nelson and Arianne Fielder of Ormsby’s to compete for the honor. This was a great way to introduce a fine liquor uncommon in most bars to a bunch of Southern foodies. In this Iron Chef-style approach to creating an excellent drink, two bartenders presented their offering to a panel of judges. Judge and Executive Chef, Shane Devereux of Top Flr looks on as Tyler Nelson and Arianne Fielder toast to their success as Atlanta's bartending elite..
Their cocktails could be of any concoction as long as they included one ingredient, Fernet-Branca. Fernet (Italian pronunciation: [fɛrˈnɛt]) is a type of amaro (a bitter yet aromatic spirit). Imagine Jägermeister without that bit of sweetness, or a savory version of Pimms. Like its English consort, Fernet is made from a number of herbs and spices. Fernet is usually served as a digestif after a meal but may also be served with coffee. The flavors vary according to the brand of Frenet, but usually include myrrh, rhubarb, chamomile, cardamom, aloe, and especially saffron, with a base of grape distilled spirits, and coloured with caramel colouring. Ingredients rumored to be in fernet include codeine, mushrooms, fermented beets, coca leaf, gentian, rhubarb, wormwood, zedoary, cinchona, bay leaves, absinthe, orange peel, calumba, echinacea, quinine, ginseng, St. John’s wort, sage, and peppermint oil. Oh, and it’s strong! Frenet contains 45% alcohol by volume. It may be served at room temperature or on the rocks (with ice). For her cocktail, Arianne created what she named the “Caribbean Hay Ride” using Frenet-Branca, 12-year old aged rum, pumpkin butter, fresh apple juice, and Bitter End Moroccan Bitters. “There wasn’t any cinnamon up here so I had to use the bitters for the flavor component,” Arianne stated. To polish of her drink, Arianne infused whiskey-barrel oak smoke into her recipe. She then covered the drinks to let them soak in the smoky goodness before presenting it to the judges. Her drink came in second to Tyler’s but for this chilly fall weather we highly recommend trying your own version of the Caribbean Hay Ride. Great read – thanks for posting this 🙂 ! 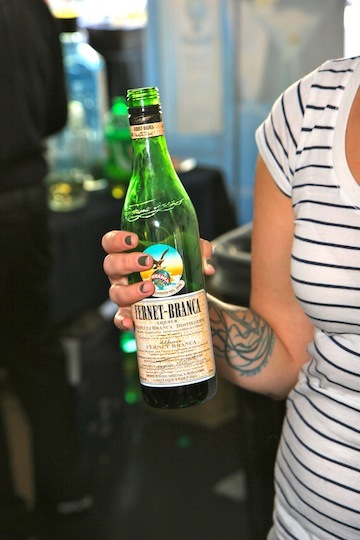 BTW – Fernet Branca has always been one of my favourite liquors. The same company also makes Branca Menta. Mix these two together in equal proportions and you have a great recipe for upset stomach and hangovers (strangely enough). Also, Fernet con Coca, as is commonly served in Argentina, is delish (use Mexican Coca-Cola though)! I’ve been experimenting somewhat at home with Fernet. It’s a great bottle to have at home! Oh yeah – Holeman and Finch not too long ago was serving Fernet ice cream – talk about to-die-for! Thanks for sharing! I’ll definitely have to stop by there next time I’m in atl!